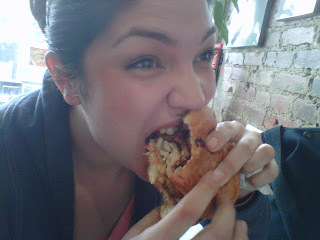 Since I'm a hungry, hungry hippo now (thanks Maryam), I figure I'd mention a little goodie we tried out fairly recently. If you're in the area of Chelsea for lunch, and feeling adventurous.. try out Tebaya. The wings that come with the sandwich, amazing. YUUUUUUUUM. The sandwich itself... eh I'll give it a YUUM. I wouldn't make this a trip.. but if you're on the block, or near by... you might as well try it out. I mean, how many places give you wings with an order?! Crispy, crunchy, sorta saucy, wings.